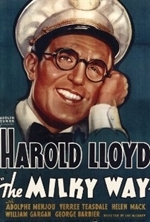 The Milky Way is a 1936 comedy film starring Harold Lloyd. Directed by comedy veteran Leo McCarey, the film was written by Grover Jones, Frank Butler and Richard Connell based on a play of the same name by Lynn Root and Harry Clork which was presented on Broadway in 1934. An example of the popular screwball comedy genre of the time, and critically Harold Lloyd's most successful talkie, it tells the story of a Brooklyn milkman who becomes middleweight boxing champion. The Milky Way features supporting performances by Adolphe Menjou and Verree Teasdale.